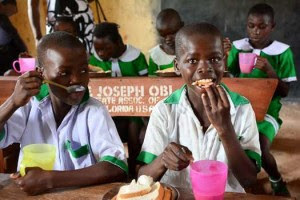 The Caretaker Committee Chairman of Gubio Local Government Area of Borno State, Zanna Modu Gubio, has introduced free feeding of pupils in all the primary schools to encourage increase in the number of enrolment. He also distributed free school uniforms and teaching materials to the 21 schools now fully in operation, following liberation of communities by troops. Gubio is one of the 20 council areas in the state that witnessed series of Boko Haram attacks, with destruction of lives and property worth billions of naira during the heat of insurgency, before it was liberated. Speaking to journalists during inspection of schools and commissioning of the newly-reconstructed council secretariat worth N85 million, the chairman said, apart from providing befitting secretariat for staff, new general hospital, clinics, mosque, classroom blocks were executed by his administration, in addition to connecting Gubio to the national grid. He said the emergence of Boko Haram crisis was necessitated by illiteracy, extreme poverty and the inability of past governments to provide social amenities for its people, especially those at the grassroot level. He, however, said with the support Gubio received from Governor Kashim Shettima’s effort in reconstructing, rebuilding and resettling of destroyed communities, he was determined to ensure that Internally Displaced Persons, IDPs, who had since returned home, settled to normal life.